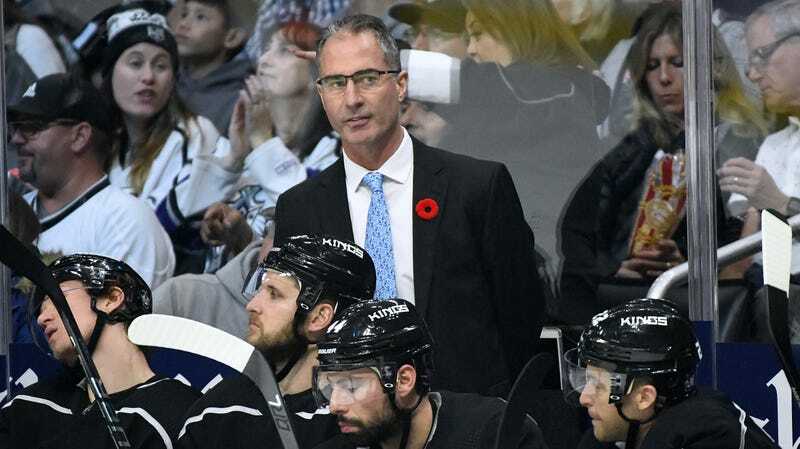 On Sunday, the Los Angeles Kings became the first NHL team to fire its coach this season, ditching John Stevens after barely more than a full season with him at the helm. The long-time assistant and short-time bench boss was let go just 10 games into the year, and he’ll be replaced on an interim basis by Willie Desjardins, who’s coming off an Olympics as head coach of Team Canada and three forgettable seasons on the bench for the Canucks. The Kings are also bringing over German national team coach and former NHLer Marco Sturm, who replaces canned assistant coach Don Nachbaur. Technically, Stevens got fired after a 4-1 win against Columbus on Saturday, but the decision was reportedly reached after a 5-2 loss against the Flyers two days earlier, which dropped the Kings to 3-8-1 on the young season. As it stands, even with the two points against the Blue Jackets, the Kings are tied on points for last place in the entire NHL, sharing that distinction with a Panthers team that’s played two fewer games. Their goal difference (-17) and their total goals scored (just 28) are both worst in the league. This is a team that made the playoffs last season. Maybe all of those problems could at least be somewhat excused if this were a rebuilding squad filled with promising prospects, but nah: This is the oldest roster in the league, and there’s no light at the end of the tunnel yet. While shot-attempt numbers put the Kings a little bit closer to league average, which might ease the panic just a bit, almost everything on the ice is going wrong for this team. Top goaltender Jonathan Quick is out indefinitely after knee surgery, and replacement netminder Jack Campbell isn’t enough to fill his skates. Anze Kopitar, after a career-best season, has struggled to regain his creative spark at the start of this one. New acquisition Ilya Kovalchuk is leading the team in points, which seems nice until you realize that he only has 11 and isn’t even in the top 70 leaguewide. The lone bright spot may be Alex Iafallo, the 24-year-old winger who’s making a name for himself in his second season, already on pace to smash his 25-point rookie year with three goals and five assists alongside Kopitar on the top line. Still, even if they change the guy on the bench, this is a worse version of the same Kings team we saw last year ... and in 2016, and in 2015, all the way back to their 2012 Cup win that featured the same core that’s trying to win games today. The Kings are old and slow and won’t compete with this roster as currently constructed. Their struggling group is on the verge of a much larger-scale transformation than the change they made yesterday.